On September 28, history was made in Topsfield, Massachusetts, when a 2,009-lb. pumpkin took the world record for most giant of its kind. The previous record holder, a 1,843-lb. behemoth from New Hampshire, lost its title by more than 160 lb. But will fame be fleeting for this not-so-garden-variety colossus? Experts believe that the newly crowned king could very well be dethroned when this year’s crop of pumpkin weigh-offs continues across the country. “Overall, the weights keep increasing year to year. With the exception of 2008, the previous year’s world record keeps being consecutively broken, and we fully expect that record to be broken again,” says Andy Wolf, secretary of the Great Pumpkin Commonwealth (GPC), an organization that hosts nearly 100 giant-pumpkin weigh-offs each year. So while the world’s first one-ton pumpkin has the spotlight as of press time, it may yet get soundly squashed—pun intended—by the competition. Hankering to see some humongous hubbards on your own? Here are seven sites where you can catch a glimpse of the world’s biggest pumpkins this fall and, according to the GPC, have a good shot at seeing a record-breaker. Just south of Portland, Gervais hosts one of the Northwest’s biggest pumpkin competitions, offering $5,000 in prize money to the largest competitor (before dropping one into a pool of rubber duckies, naturally). Around 3,500 people from all over the country trek to Frerichs Farm in Warren for its annual pumpkin weigh-off and festivities, where the world record was won in 2005. In the past three years, Nekoosa pumpkins have placed in the top 10 worldwide, even netting a second-place finish in 2009. Wisconinites hope for a local winner to climb to the top this year. Pumpkins make appearances at Elk Grove’s festival in the form of a tub race and a dessert contest, but the real attraction is the pumpkin weigh-off. Last year’s second-place pumpkin earned its title here. To prove Half Moon Bay’s not just another pumpkin-fest, this year, organizers are doling out a big payout to the biggest producer: a megaprize of up to $25,000 for a one-ton pumpkin to top Topsfield’s. 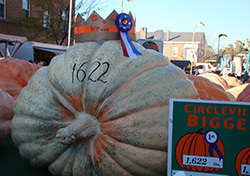 This contest has been consistently churning out world heavyweight pumpkins, including the top finishers in 2009, 2010, and 2011. Last year, the total weight of the entries was a mind-boggling 58,725 lb. A pumpkin weigh-off kicks off this four-day festival honoring the orange orb. Munch one of the 100,000 pumpkin donuts that are served annually while you check out the enormous entrants. Are you planning to see any big pumpkins this year?